The Ray and Maria Stata Center will open as MIT’s Building 32 over spring break, said David J. Silverman, a facilities department senior project manager. The MIT-Microsoft iCampus partnership has awarded its fifth round of funding for student projects. 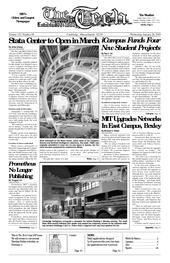 Four groups will receive $30,000 for the next 12 months, working on software to help dormitory desk workers, TV screens to display campus news around MIT, GPS receivers to track MIT’s sailboats, and computer-aided molecule models, said Rebecca G. Bisbee, an iCampus administrator. Major network upgrades will soon be finished at East Campus and Bexley Hall, with more dormitories to follow next year. Prometheus, MIT’s monthly newspaper about responsibility and freedom, has disbanded after two issues, said Tara R. Diduch ’06, the editor in chief. Early applications for the Class of 2008 decreased by 21 percent from last year, but a surplus of regular applications almost made up the difference.